Today we had sunshine, so it was good to be outside enjoying nature. At the Three Muses Challenge the theme is 'get ahead, get a hat'. I am also linking to Moo Mania and More, corrugated cardboard. I made these tags last week, but didn't get round to posting them till today. The first one has been made from cardboard, partly peeled, painted with gesso, and collaged with letter fragments and gilding flakes. The image is from a magazine ad, and has been fancy cut, and crackle glazed. Now the lady has wrinkles! I gave here a hat - with hat needle - and embellished her with lace and little roses to complement her flowery hair style. The second hat tag was an 8"one on which I had tried out some stamping and collaging, which I didn't like. I ripped off what I could, painted over the rest, and added some paper napkin scraps using mod podge. The lady was a magazine cut out, which I varnished and collaged. The hat with the watering-can she is wearing is a brooch which I have had since I was a kid. The needle has been missing for years. I will put this tag on my memory wall, as it is a souvenir from past times. Yesterday I walked down to the lake near here, a lovely peaceful corner - at least when no kids are playing there! I am happy to say that the sun came out a bit today, and it hasn't rained yet! Yesterday morning it just drizzled, so it was still possible to have a good walk and visit the ducks. But in the afternoon I was only able to take some photos from the window - I don't mind getting wet, but that was definitely too much! I am still busy making tags with lots of texture, and this one started off more or less by accident. I tried the colour I had mixed on what I though was a piece of brown paper, and then saw that it was my lovely glassine paper, which I didn't want to waste. When the paint was dry, I covered the paper with torn pieces of a pretty paper napkin that Mo sent to me, and mounted it onto some black card to make it stronger. After it was dry I added the diamonds with a stencil and metallic texture paste. I thought this looked like a good place for the Umbrella man, especially with the weather being so wet, so I cut him in black and put him in the picture. I used more of my wonderful gilding flakes on the butterfly, and between the diamonds. I mounted it onto some coordinating card. I am linking to Paint Party Friday, and Craftroom Challenge, Things with wings and to a vintage journey, get some texture, as this is much inspired by Tim Holtz' techniques using layering, stencils and embossing pastes. On my way home today I spied this sweet little mouse. She was not at all shy, and did not mind me squatting down beside her to take some photos. 2 other ladies came along and we all took pics - she just ignored us, and went on looking for food! I hope you had better weather than we did today; it poured non-stop. I put my waterproof jacket and cap on and went out in spite of it, and enjoyed my solo walk along the Rhine. Nobody else was around, so I walked along singing 'Singing in the rain' and came home dripping but happy. These are times when I appreciate how good it is to come home to dry clothes and a hot coffee! I made this accordion book a couple of weeks back, and never got round to showing it. The covers are made of painted chipboard. I used my fave mix of green and blue metallic paints, and decorated it with diamonds embossed in white structure paste. The rest of the background was stamped with my script stamp, and then I glued some letter fragments on. The bird is an image from Gecko Galz. For the back I used one of my hand-painted umbrella men. The inside pages have small, sewn inserts, one on this side and two on the other. 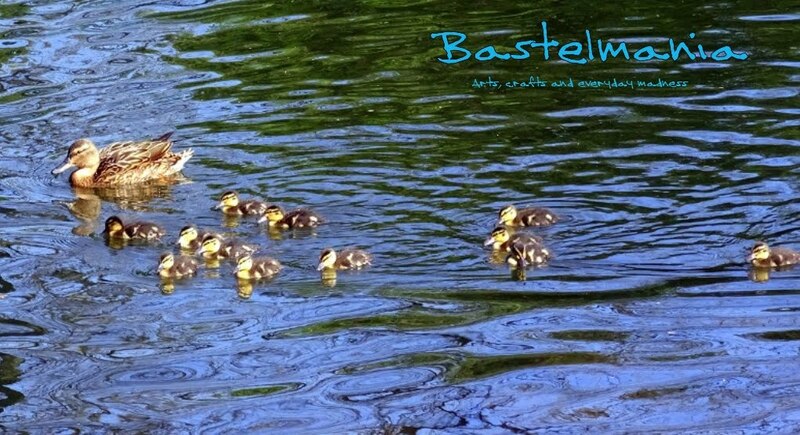 I hope I did not grow webbed feet like the ducks! 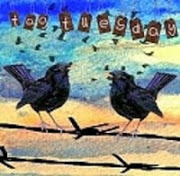 It's Tuesday again already, time flies by soooo quickly, and this time it's a double Tuesday again, with a new challenge at Try it on Tuesday as well as being new tag time at Tag Tuesday. The theme for the next fortnight at TIOT is 'feminine and fancy', so I am sure a lot of you ladies will have some sparkling ideas for it, and you have 2 weeks to link up. I made a giant and rather wild tag, with lots of shoes and accessories on a rather bright background. I know a lot of us love shoes and clothes, and never have anything to wear at home.... I don't buy much these days, and my shoes are limited to boots, trainers and sandals, but I do like window shopping! The dress form and shoes have been stamped and white embossed, then fussy cut. 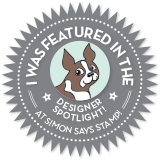 The shoe stamps are from Hampton Art. 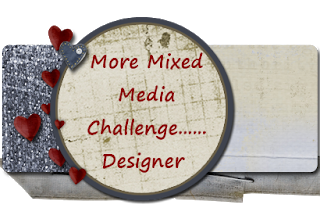 I am looking forward to seeing what you think up for this challenge! At Tag Tuesday our theme is white on white - not a fave of mine, as it leaves little room for nice, dirty distressing....although I did enjoy the cardboard and gesso! But I did my best. I painted a corrugated cardboard tag with gesso, and used some white Utee down the right side. I could have spared myself that step, as it is all covered up with the embellies! Then I threw on all the white stuff I could find. The bird-cage, bird and large flowers are TH die cuts. The heart is really white, not pink, it is made from Holographic foil which reflects lots of colours. I am also linking to Moo Mania and More, cardboard. And last but not least, some photos of the blue skies yesterday - today it rained nearly all day. Here's wishing you all blue skies and sunshine! Hope you have had a good weekend, and that those of you in the States are enjoying your long Memorial weekend. We had another day of sunshine and blue skies here, but tomorrow it will be back to rain, thunder and lightning - variety is the spice of life! At Moo Mania and more the challenge this fortnight is to use corrugated cardboard, and as most of you know, this is one of my fave materials. The tag has been made from an old box, which has been partly peeled and distressed. I coloured it with distress inks which were embossed with perfect pearls in various metallic colours and then added some of my wonderful gilding flakes. The heart, crown and wings have been cut with a TH die, and fixed with foam squares. I mounted it onto a second tag cut from black card from an old calendar. The medallion was sent to me some time back by Jenny, and I have used a Leonardo image from the vintage visions circle sheet from Gecko Galz. I glazed it with some thick varnish. The second cardboard piece is a mini book in Moo format. The cardboard has been painted with cream and terracotta, and once again I added gilding flakes, and some fragments of old letters. I sewed the pages together using a piece of printed linen, which I fixed to the inside covers with DS tape. This was another fun make. 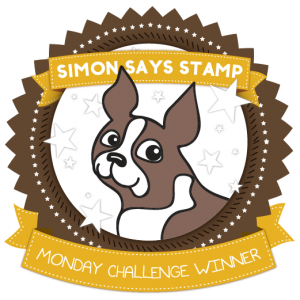 Stamp people, mail art, this and that. A Matchbox, a WIP and some little quackers. Coffee, Circles and a Historical Event.